How much is a pineapple worth? Is a strawberry really better than a cherry? What does that spiky fruit at the supermarket actually taste like - does it taste any good? Where does the humble apple fit into all this? Every fruit analysed and rated according to how weird they taste and how /good/ they taste. I have tried to taste as many of the fruits as I could (and on more than a couple of occasions in case they were off). Naturally, I won't have tasted every kind, so expect to see numerous updates to this site in the future. Each fruit is assumed to be optimal in terms of ripeness and type. Further separate ratings will be given for sweet/bitter and sharp/flat. c: Papaya, Cherimoya, Sharon fruit, Pomegranate and 4 types of grapefruit added. Many more tweaks and adjustments to the ratings. Page sorted by 'weirdness factor' complete. Fruit pictures added. In the future, expect art pictures of fruit for every one reviewed! Lots more pictures of fruit. Also added the 'Date' fruit. Fixed many bugs in page (esp. for Netscape). More fruit pics done and also added anchors and trivia for each fruit picture too. 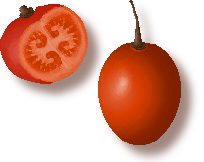 Added fruit poll (vote now!) and increased score of Papaya. Reviewed 6 more exotic fruits! Dragon fruit, Granadilla, Guava, Starfruit, Tamarillo and the awesome Mangosteen! An update at last. Added further fact trivia, unreviewed fruit names, and juggled the fruit ratings a bit (such as upgrading the cherimoya). Also reviewed the worst fruit ever. Behold - the 'Tamarind'. Changed side pattern on the left and main banner at the top, so a graphical change for the better. For the curious, this is how the site used to look in 2002: superold 2002 version. Properly added blueberry fruit (it was accidentally called blackcurrant before). 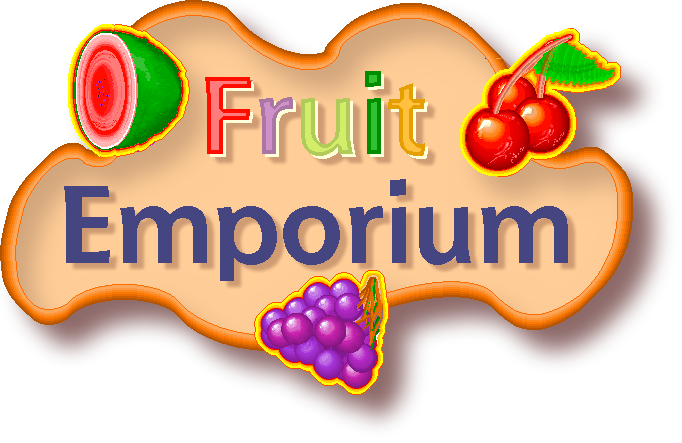 Also added corrections and trivia throughout the page and (hopefully) useful fruit shop adverts such as gift fruit baskets, fruit trees, fruit plants, drink and even soap! They are labelled as adverts so you don't confuse them with the main content. Wow. I don't think anything could quite match up to the 'fruit' under review here. The Tamarind consists of a sticky, dry, pulpy fruit which is 'contained' in a long, dull brown 'pod'. Just the sight of it is enough to turn you off in disgust, but nothing could have prepared me for the profound taste sensation I was to experience. 2% of you considered the rambutan one of your top five fruit. Woah, this does look weird - like a lychee that's suddenly decided to de-evolve and grow hair. Apparently, it's meant to taste like a lychee too, so let's put the two to the test. Just like the tomato (and even the cucumber), the Avocado is more of a 'subfruit' with some of the properties of a vegetable. 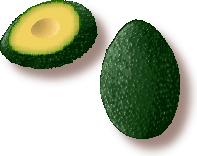 22% of the Avocado is pure fat - the most of any fruit! This is the fruit you've voted the worst, and not surprising really. In fact only 1 in every 80 people included this in their top 5 fruit. 'Paw' by name - poor by nature. It is in fact even more boring than a watermelon if that's possible. Suffering from the same problems that plague other fruit, it basically tastes... a bit like a vegetable. I can't quite pin it down, but maybe something like cucumber or tomato. Originally called the 'tree tomato', this erm... 'fruit' was renamed to 'tamarillo' for marketing purposes (natch). 3% of the people surveyed liked the tamarillo. An unusual variety of banana turns maroon / dark purple when ripe (with pinkish flesh), but true banana buffs will want to try and get hold of the 'Ice-cream' Banana. It's actually blue in color (!) and tastes like vanilla custard. Even the texture is strange - something akin to marshmallow! 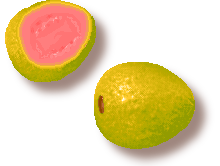 What I also hate about the guava is the stupid amount of small rock hard seeds inside. Could the deep green guava taste any better? 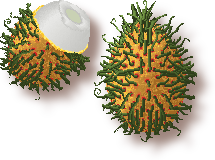 Firstly, the version under test is the lime green/yellow version with pinkish flesh inside. There's also a version with deep green skin and green/yellow flesh too - which might very well be tastier than this. * He was force fed two thousand rambutans swilled down with a dragonfruit milkshake - a fate worse than death.